One of the most popular images sold on papyrus at souvenir shops in Cairo is that of the Three Musicians. The original scene appears in the Tomb of Nakht. Most organized tours won’t take you there, because it lies in the Valley of the Nobles where the tombs are generally small and less impressive than the Valley of the Kings. The tomb of Nakht is small, too small for most tour groups to cram everyone in. If a group of more than a handful of people goes, chances are they will need to take turns going in while the others wait outside. Because the tomb is small, there aren’t many scenes to view inside. Most tourists would rather see the spectacular tombs found in Valley of the Kings. Nakht lived under the reign of Tuthmoses IV, around 1401-1391 BCE. He was a scribe and a temple star watcher. However, I’m a different type of tourist. I enjoy seeing the things that the big tours don’t go to see. I have visited this tomb several times because I like this scene so much, I enjoy going back to see it again. Andrea Deagon has theorized (in an article you can find on my web site) that the woman in the middle might be dancing. Papyrus purchased in Cairo with the image of the Three Musicians. I asked my guide to tell me about the overall scene. In particular, I asked him if this was a temple performance done by priestesses. He emphatically said NO. He pointed off to the right a section of the scene that doesn’t appear in this photograph which showed Nakht and his wife watching, and he said that this was merely entertainment for the pleasure of Nakht and his family. 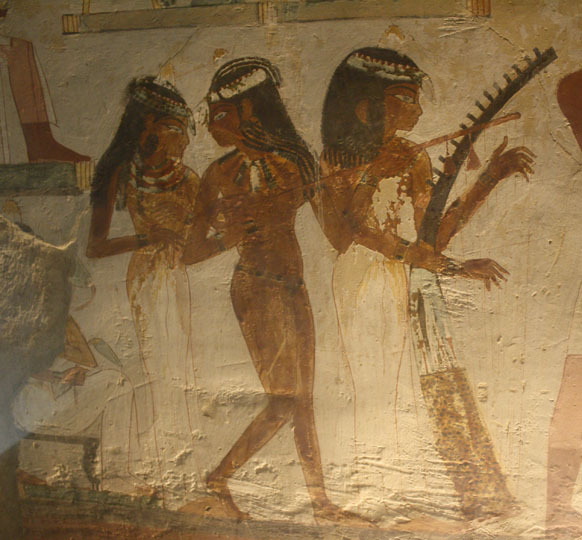 Music and dance in ancient times were NOT always about religion. Sometimes they were, but not always. 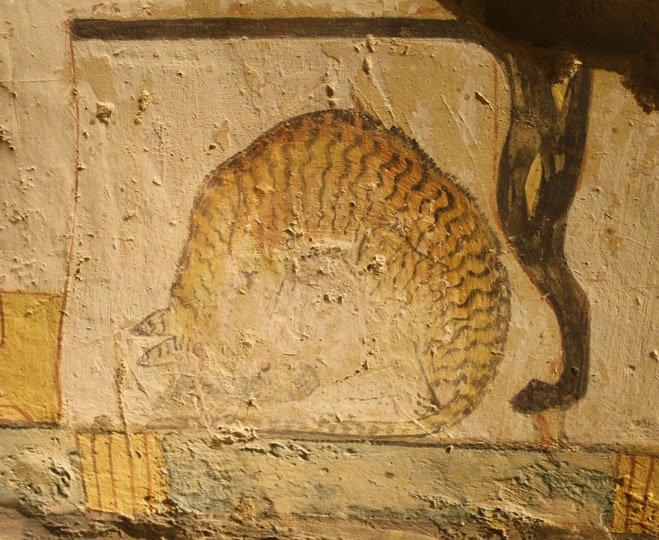 Another part of the artwork inside this tomb features a cat, curled up in a ball. We hear so much about the Egyptian cat goddess Bastet, but I find this image charming because it looks like a family pet snuggling up for a nap. Egyptologists call this Theban Tomb TT52. They believe it’s from around 1400 BCE, which means it’s about 3,400 years old.